OHSHC. Awesome অনুরাগী Art. ;). Wallpaper and background images in the ঔরান হাইস্কুল হোস্ট ক্লাব club tagged: ouran high school host club. I don't get all of the characters and who's supposed to be who. Some of them I do but not all. lol! i get it! luv the artistic work! luv the pikachu in the corner. Finnaly someone combines the 2 best anime's in the world. 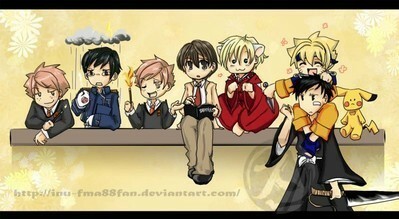 Ouran HSHC and Pokemon. Lol, I hardly recognized any of them.. I knew Usa-chan is Pikachu, Haruhi is Kira, and Honey is Naruto.. but that was it.